A right triangle (or right-angled triangle, more commonly in British English) has three sides, with an angle that equals 90º - that is, a right angle. The analysis of ratios between sides of right triangles with hypotenuse = 1 is at the heart of trigonometry. The sine of the angle at A is determined as the ratio of a/c, the cosine as b/c and the tangent as a/b. 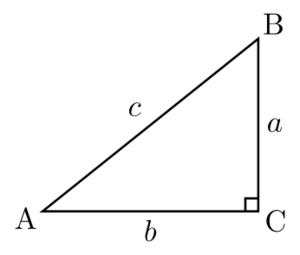 Relative to the angle A, the side b is described as the adjacent side and a as the opposite side. This page was last modified on 9 February 2017, at 19:51.